A handicraft is a product, which is made with the use of hands. It is a work of active imagination, where a craftsman gives vent to his/her thoughts thereby conceiving a unique product. India is a country of diverse traditions, where there is an amalgamation of a number of cultures, values and religions. Our rich heritage is reflected in the handicrafts, which form an intrinsic part of almost all states. States differ in the kinds of handicrafts that they offer, depending on the cultures and traditions of the majority of locals. Bookbinding, sewing, stitching, spinning, weaving, knitting, crocheting, lace making, tatting, puppet making, wall hangings, needlecraft, needlework, art and crafts all fall under the categories of handicrafts. Indian Handicrafts are an exquisite and spell binding variety. They come in vibrant colors, motifs and designs and thus are a rage in the domestic and international markets alike. The techniques and crafts employed while making these handicrafts are centuries old and have been perfected by the craftsmen over many years. Making handicrafts is a family tradition and the skill is generally passed on from one generation to another. Delhi: During the Mughal period, the state was well known for kundan work and meenakari. Delhi is the only state in which the art of meenakari is still alive. 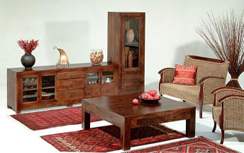 The craftsmen here also make items of wood like, trays, tables, boxes using inlay work. Handicrafts are, as said earlier, made using hands...a skilled pair of hands. This skill is not new; it has been passed on from one generation to another. In today's age and time, everything is produced/manufactured using machines. Handicrafts are a refreshing change, as no two items can be the same. They are one of their kind and no two people can have the same piece, there are bound to be differences. This makes them exclusive and give them a designer status. Our government is playing an active role in promoting craftsmen from various states to continue with their family traditions. Almost all states have emporiums, where these craftsmen can exhibit their art, and display it to a vast audience, both local and international. 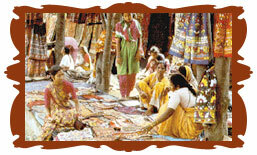 The market for handicrafts is thus a booming one, which promises of being lucrative.